The market correction was largely driven by decline in financial sector scrips. In 2018, financial sector was adversely affected by rising interest rate and growing NPL problems which dominated its stock market performance. Financial composite which includes Bank, NBFI, and Insurance declined by 18.6% against overall market decline of 13.8%. On the other hand, outperforming the market in 2018 (Figure: 2). Macro factors reigned supreme in 2018. Expectations of currency devaluation prompted foreign fund managers to book profit, partially liquidating their stakes in local blue-chips. Large cap dominated Telecommunication and Pharmaceuticals were hit the hardest by this wave and declined significantly, despite solid fundamentals. 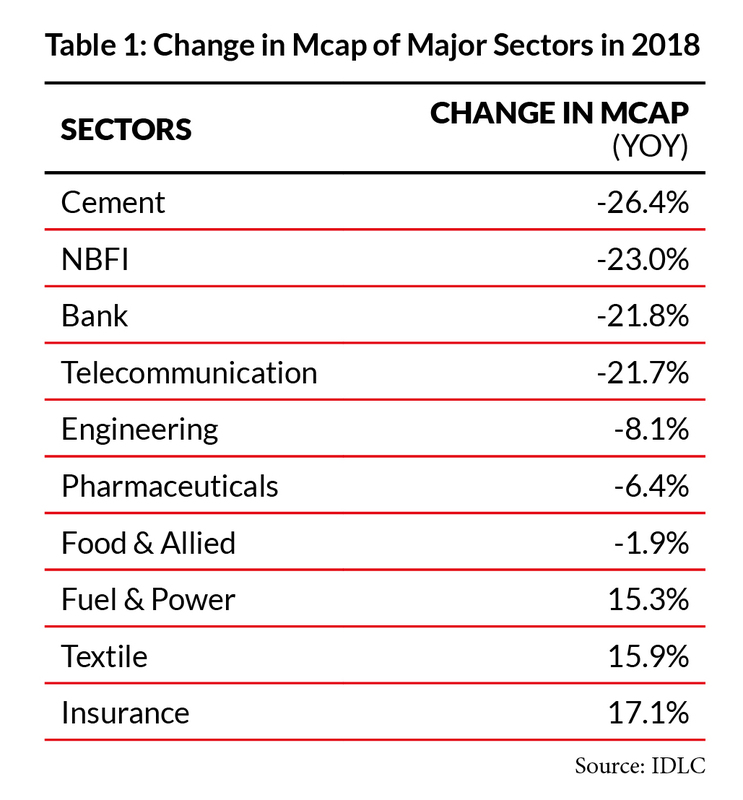 Bank and NBFI lost over 20% of Mcap in 2018, suffering from asset quality and interest rate concerns. (Table 1). Macro factors were positive for Textile Sector, which rallied almost 16%. Textile business returned to a growth momentum after a long time, benefitting from US-China trade war and cheaper BDT. Fuel & Power sector also surged, backed by earnings growth coming from the government’s power plant binge. Bangladesh was the worst performer among the peer emerging and frontier economies in this region (Figure 3). Rising US interest rate and currency triggered net outflow of foreign portfolio investment across the region. 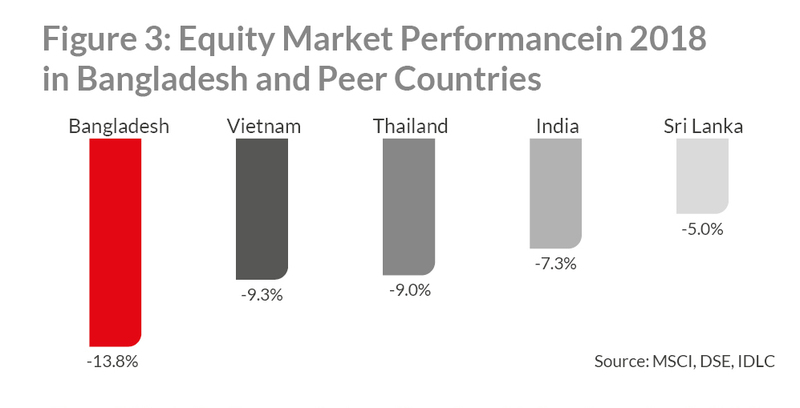 Regional economic power India declined by 7.3%, while Bangladesh’s close competitor Vietnam shed 9.3% in 2018. Interest Rate Hike: Interest rate hike was the key driver of market performance in last year. After years of gradual decline to a comfortable level, interest rate shoot up in early 2018. Difference between bank deposit rates and risk free rate offered by National Savings Certificates (NSCs) widened as the former steadily declined for a long period until 2018, and the later remained unchanged out of sync of market. Increasingly negative risk premium incentivized individuals and institutions to divert their funds from capital and money market to NSCs. Liquidity was thus tightening for a while and reached a critical point in early 2018. As banks scrambled for funds to maintain their AD ratio, interest rates shoot up. Regulators intervened to soothe rates with emergency measures. 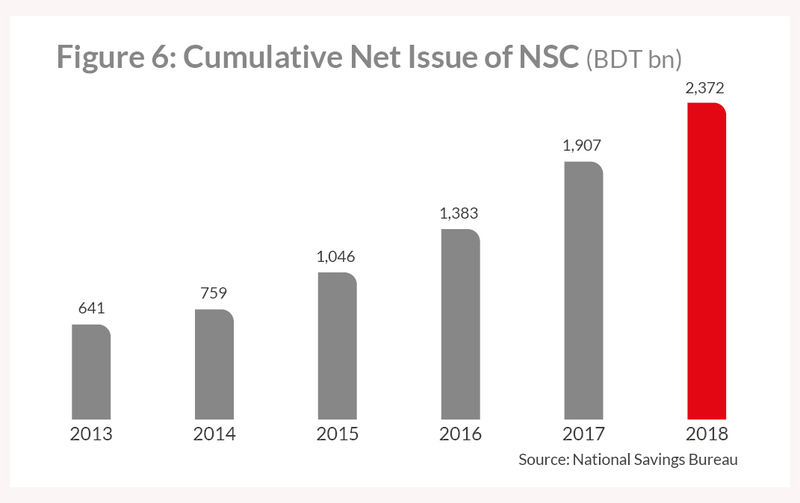 As long as NSCs rates are not linked with market and investment in NSCs are not monitored, and NPL issues are not addressed, market interest rates cannot remain low for the medium-long term. BDT liquidity from the market. In anticipation of currency devaluation, foreign fund managers lowered their exposure from capital market of Bangladesh. Large caps were affected the most by this and pulled index down with them. Corporate profitability was also hit as cost of imported raw material rose. Banking Sector Turmoil: Already weakened by macro pressure, vulnerability of banks asset books were further exposed in 2018. As on September 2018, banking sector NPL stood at 11.5%, which would go up to 17%, if rescheduled and restructured loans were taken into account. 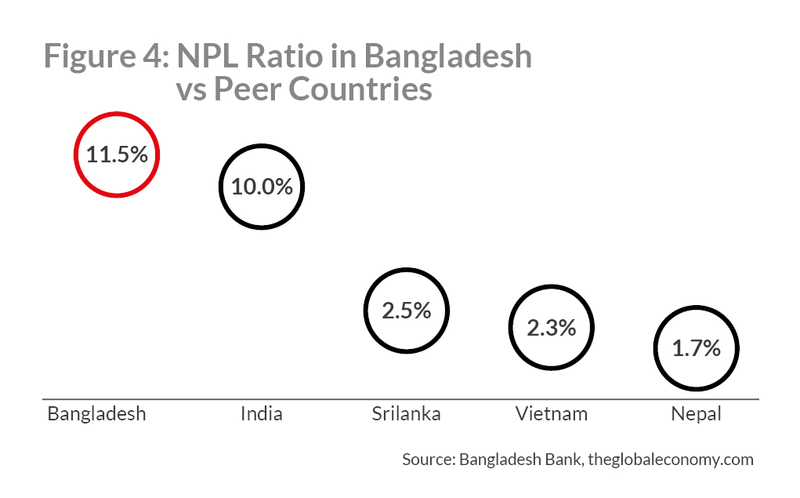 NPL in Bangladesh is one of the highest in this region (Figure 4). Trouble with a fourth generation bank reached a critical point in last year, leading to a government administered management change. The weak state of its books brought fragile financials of the other fourth generation banks into limelight. Meanwhile, asset quality of public sector banks did not improve. A few of the private commercial banks also revealed to be in dire straits. Such state deterred investors causing a rout that shed almost USD 2 bn of Mcap from the sector. Political Environment: Caution over political environment was a palpable catalyst of 2018’s market. Market participants were defensive as election approached. However, compared to previous elections, political environment was rather calm as the election approached and passed. Strategic Partnership between Dhaka Stock Exchange and Chinese Consortium: The most important event in capital market of Bangladesh in 2018 probably was the strategic partnership between DSE and a Chinese consortium of Shanghai and Shenzhen Stock exchanges. The consortium took 25% stake in DSE in exchange of USD 125 mn, valuing the exchange at USD 500 mn. The deal promised additional technical assistances worth USD 37 mn. The strategic partnership is expected to make significant contribution in improvement of local capital market. We look forward to the partnership delivering its promises. Regulatory Developments: One of the biggest regulatory move in 2018 was extension of tenure of closed end mutual funds for another term of 10 years, provided that the total tenure of the mutual funds don’t go beyond 20 years. On the aftermath of the decision, total market capitalization of closed end mutual funds declined by 7.1% or BDT 2.6 bn by the year end of 2018. Whereas, market capitalization of DSE declined by 0.9% during the same period. 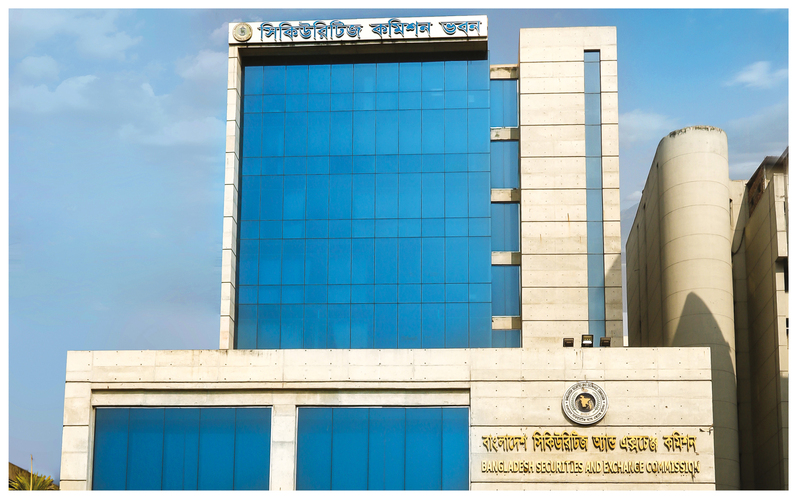 In 2018, BSEC approved draft Bangladesh Securities and Exchange Commission (Qualified Investor Offer by Small Capital Companies) Rules, 2018. The rule is expected to facilitate a separate market for small cap companies, increasing efficiency of overall market. Merger & Acquisition activities: Three big M&A activities took place in the local market after a long time. Earlier in 2018, global Fin-tech giant Ant Financial took 20% stake in local Mobile Financial Service provider bkash, a subsidiary of listed Brac Bank Ltd. The entrance of the global leader in the industry is promising potentials of rapid development and innovation in the local MFS industry. In late 2018, under a global transaction, local consumer business unit of GlaxoSmithKline was acquired by Unilever. In last year, privately held tobacco business of Akij group was fully acquired by Japan Tobacco International at a valuation of about USD 1.5 bn. All these big M&A activities reflect increasing interest of global giants in Bangladesh. Given the growth story of Bangladesh, we believe the interest to get even keener in coming days. The government of Bangladesh expects that GDP growth would stand at 7.8% YoY in 2019, while inflation would be 5.6% YoY. Economic Intelligence Unit predicted Bangladesh to be the second best performing economy in the world in 2019, growing by 7.9% YoY. In concurrence, United Nations predicted Bangladesh to be third fastest growing economy with a growth rate of 7.4% YoY. We believe post-election stable political environment will attract domestic and foreign investment and boost growth. As both export and remittance shows sign of significant improvement while import growth slowed, current account balance should also improve, easing pressure on currency. Bangladesh Bank expects Trade Deficit to be USD 17.2 bn, and Current Account Deficit to come down to USD 6.4 bn, while BOP situation to remain almost unchanged at a deficit of USD 0.6 bn. However, money market may remain stressed until NSC rates rationalization, NPL buildup, such structural issues are addressed. 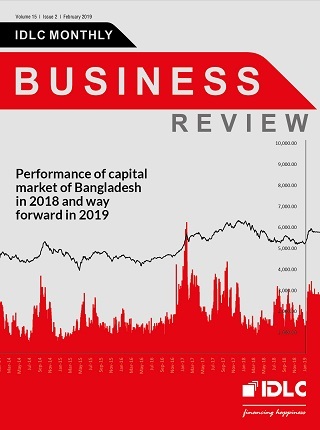 Banks: The year 2019 is expected to be a better one for Bangladesh economy. We expect current account deficit to moderate at 2% of GDP from 3.6% of GDP (deficit) in 2018. This is likely to ease the currency devaluation pressure. Besides, political stability is expected to continue after the peaceful election of 2018. However, high NPL is still acting as the systematic risk of the industry. We are yet to see any solution of this issue although the new finance minister is optimistic about bringing down the NPL ratio. In addition, higher money flow in the NSC instruments is also a serious concern for banking industry. Telecommunication: Overall outlook of telecommunication sector seems to be positive in 2019 with continued business growth driven by rising demand of data. Bangladesh is still lagging behind on some important parameters like internet penetration (36% as on 2017) and smartphone penetration (31%8 as on 2017), indicating huge room for growth for MNOs. On a different note, the ongoing regulatory developments in the industry should be kept in mind which may have impact on the performance of the listed companies. would remain in play. Pharmaceutical companies that position itself the best in changing patient needs would deliver significant value for both patients and the investors. One of the key issues to look for in 2019 would be whether prices of essential drugs are re-fixed. A balanced re-fixation can serve customers purpose and incentivize pharmaceutical companies in investing more on such drugs. Export performance of major pharmaceutical companies are to be observed closely. While, contribution of export to total business is still low. Fuel & Power: Our optimistic macro expectations cannot materialize without higher output from Fuel & Power sector. The sector is vital for economic development and stays at the focal point of government’s attention. We expect profit of the sector to increase in the coming years as power generation and ancillary services grows rapidly. Consumer: Consumer sector in Bangladesh is in a secular uptrend. As our purchasing power rises, and middle class population expands, consumer business are set to rise. Consumer staples are expected to stick to its steady growth, while discretionary may get a boost on a post-election spending surge. Construction: A whopping sum of USD 2.1 bn has been allotted for Annual Development Program (ADP) in budget of FY2019 out of which a total of 835.8 mn would be spent for infrastructure development in communication and energy sector. These ongoing and planned infrastructure development projects are expected to drive the business growth of the companies related with construction materials. Additionally, the housing sector has showed some sign of recovery recently, driven by factors like expanding middle class population, long-term house loan facility at low interest rates for government employees etc. 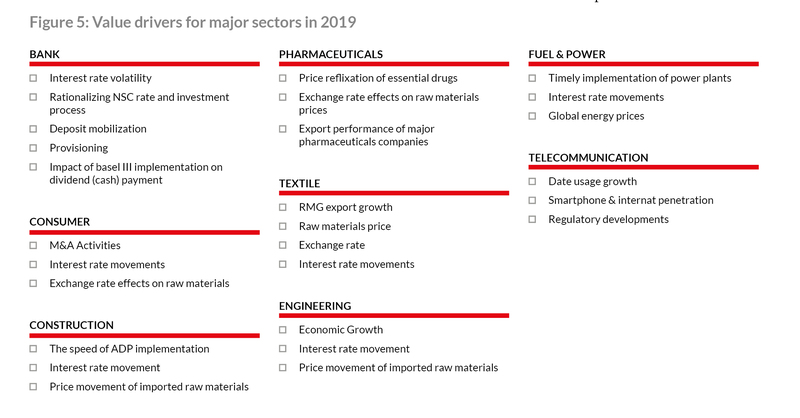 However, fluctuations in price of the imported raw materials like clinker, iron ore, billets and oil may impact the bottom-line of these companies. Engineering: The companies under engineering sector are engaged in varieties of business. Among them, commercial vehicle industry is expected to grow with rapid industrialization and communication infrastructure development in the country. Textile: Textile sector should continue its momentum from 2018 leveraging increased orders thanks to weaker currency and trade war. Increased minimum wage would increase labor cost for the sector, but that is likely to be offset by increased order flow. Keeping power cost in check is a critical for profitability of the sector. In the long run market always and everywhere reflects fundamentals. As we expect fundamentals to remain strong in economy and major sectors, we naturally expect market to perform better. However, it’s critical that interest rates remain under control and liquidity condition in the financial markets remain conducive to business growth. The ruling party has recently formed its third consecutive government. Because of the continuation of the regime, we naturally expect policy continuation and consistency. However, there are some early signs that make us anticipate major momentum in qualitative improvement of the country. The young cabinet has taken some initiatives especially in financial sector that if followed through, can instigate major changes in governance and regulatory oversight. We expect government initiatives would play a major influence in this year’s market performance. Specifically, we have following broad expectations from the government. Stronger Oversight in Money Market: Our earnest expectation from the government is that it implements strict oversight on the economy and particularly on financial sector. Weakness in the financial sector remains a major challenge to our economic potential. As on September, 2018 overall NPL ratio stood at 11.5%, much of which comes from state owned banks. It is estimated that NPL ratio would go up to 17% if rescheduled loans are included. The NPL ratio does not include the asset quality of NBFI sector. Some NBFIs are at a precarious state and may cause significant stress on the financial system, despite their smaller sizes. With such high NPL ratios, interest rates cannot sustain at single digit. The situation should immediately be dealt with to put our economy on a strong footing. Stronger Oversight in Capital Market: Our capital market is small in size and dominated by individual investors. Such markets are globally riddled with malpractices like insider trading, and price manipulation. Such practices inhibit long term growth of the capital market by portraying it as an unviable market of financial intermediation. The Regulator needs to invest more in surveillance activities to identify wrongdoings in capital market. Proven wrongdoer should be punished in an exemplary manner proportionate to their crime, so that potential wrongdoers are deterred. Interest Rate rationalization: The high interest rate of National Savings Certificate has created an imbalance in the monetary system. Massive amount of savings is being diverted to National Savings Scheme, mopping up liquidity from banking sector (Figure 6). To attract deposit, banks have to increase deposit rates which in turn increases lending rate, making investments costly. NSC rates need to be rationalized and it must be ensured that NSCs are accessible by only the intended populace at intended amount.Finance ministers recent initiatives to create database of NSC investors is a laudable improvement in this regard. We hope the new government is successful at implementing this database and take steps to rationalize the NSC rate. Fixed Income Market: Development of a fixed income market has been a critical need for the capital market of Bangladesh. Banks are the disproportionately large financial intermediary in the country. As banks focus on short-medium term financing, there is no channel to mobilize savings for long term investments. A fixed income market can fulfill this gap. Development of fixed income market has to start with development of a secondary market of government bonds. If the government can establish this, pricing of related instruments becomes easier and financial system wide maturity mismatch can be tackled. A developed bond market can not only finance long term corporate projects, but also large government infrastructure projects. Only by developing a bond market, government can mobilizes domestic resources to finance infrastructure and reduce foreign currency exposure. Presently, issuance of bonds is a lengthy process, requiring approvals of the relevant regulators before issuance. But, business and interest rate environments are very dynamic and may radically change during this period so much so that the business case and the rate attractiveness of the bonds may diminish. Addressing the fast pace of modern business, Indian regulators require only notification of compliance with guidelines after issuance of bonds, scrapping previous practice of approvals before issuance. The regulators may consider adopting such international best practices to facilitate bond market development. Promoting Professional Fund Management Services: Mutual Funds and institutional portfolio management industry is at a nascent stage in this country However, asset management industry is a prerequisite to transforming the capital market to a stable market for wealth creation. Professional fund management services can protect individuals from the volatility of the market and deliver return to meet their investment goals. The government may consider forming policies that promote institutional fund management services to help citizens better manage their financial wealth. 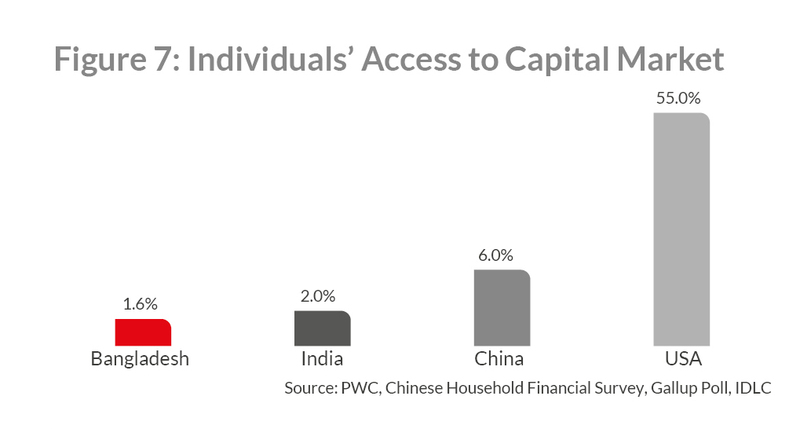 Individuals’ access to capital market is less than 2% in Bangladesh (Figure 7). Professional Fund Management services is necessary to make capital market more inclusive. Additionally, Fixed Income Mutual Funds can play a significant role in developing bond market. Fixed Income Mutual funds can divert individuals’ savings direct to corporate finance, bypassing banks. As a result, cost of borrowing for corporates decreases and investors return on investment increases. Globally fixed income funds herald fund management industry. In India, the asset under management of Mutual Fund industry is USD 337 bn, 54% of which is invested in fixed income securities. 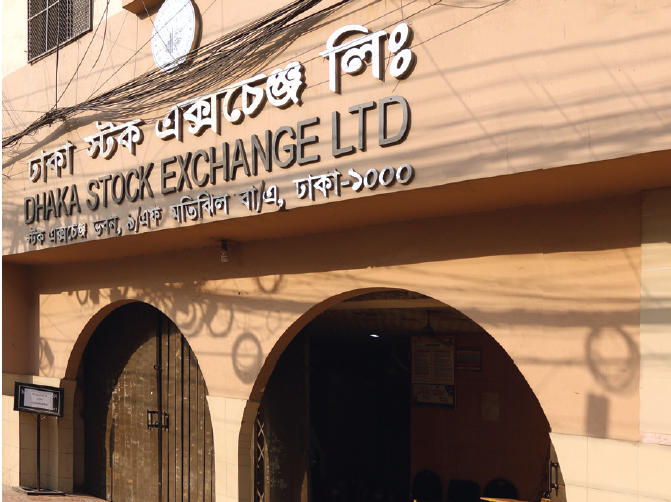 Bringing Large Corporates to Capital Market: The capital market of Bangladesh is lagging behind the economic growth of the country. 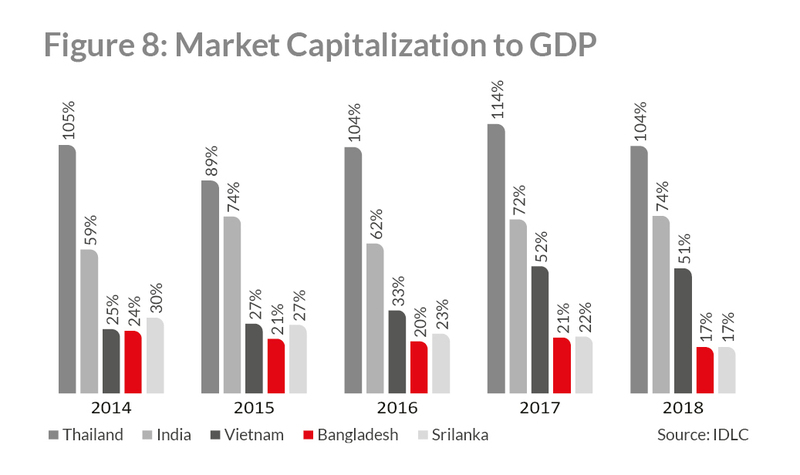 In 2014, Mcap/GDP ratio of Bangladesh stood at 24%, which has come down to 17% in 2018. While the ratio improved or stayed almost flat for the peer countries (Figure 8). Lack of listing of large corporates in the market is the primary reason behind our falling Mcap/GDP ratio. Government may focus on reducing the time it takes for a corporate to raise money through IPO to increase the attractiveness of IPO as a financing option. The process should be simplified following global best practices so that corporates consider it a viable alternative source for financing. Attracting and facilitating domestic and foreign Investment: Despite its amazing growt potential, Bangladesh lags behind in attracting foreign investment compared to its peers. Although a smaller economy, Vietnam consistently attracts substantially more FDI than Bangladesh does. In 2017 alone, Vietnam attracted FDI of USD 14.1 bn, 6.6x higher than that by Bangladesh. Even Myanmar attracts more FDI than Bangladesh. 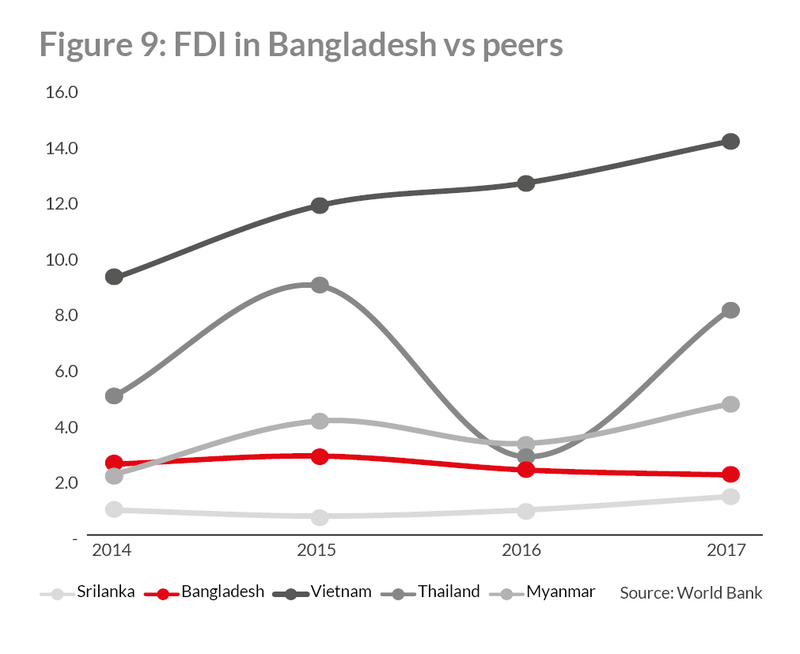 In 2017, Myanmar attracted twice as much FDI than Bangladesh did (Figure 9). Doing Business Index by The World bank ranks Bangladesh at 176th among 190 countries based on ease of doing business in a country. Bangladesh is ranked the lowest in South Asia, even 10 notches below Afghanistan. Bangladesh needs to improve its position in the areas covered by the Doing Business Index. This effort alone can attract significant FDI to Bangladesh. 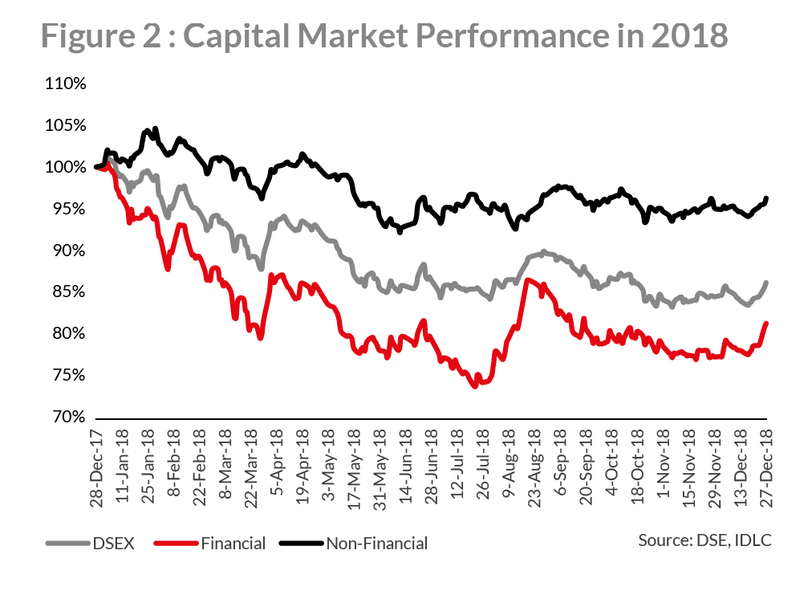 In line with global equity markets, capital market of Bangladesh had a rough year in 2018. However, recent developments in global economic and political arena present unique opportunities to Bangladesh. Availing these opportunities, Bangladesh can take its growth momentum to the next level. Not only government, but also supranational economic agencies expect robust economic development for Bangladesh in coming days, provided that the country can exercise fiscal and monetary prudence. If the country can keep its fundamentals right, capital market is certain to deliver amazing return.